Rex Tillerson may be fourth in line for the presidency, but Americans could probably identify President Trump’s chief strategist, chief of staff, and Education secretary more easily than his secretary of State. The immediate reason for Tillerson’s low public profile is that he’s yet to make any public speeches, and in the past month the State Department hasn’t offered any daily press briefings, a tradition that dates back to the ’50s. 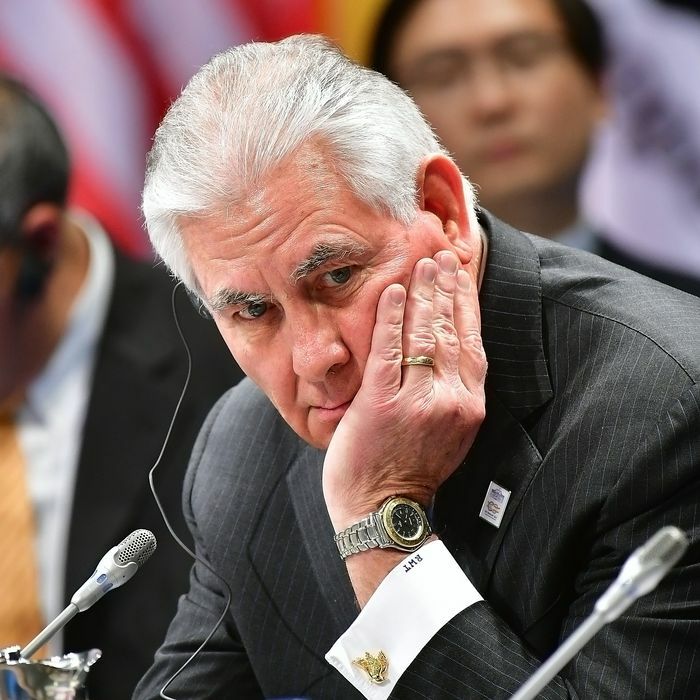 While the former Exxon CEO speaks with Trump regularly and has had meetings with various foreign ministers, he was not present during the president’s recent meetings with foreign leaders. While the State Department has been the leading voice on foreign policy matters in previous administrations, it appears the department has been sidelined, with top Trump advisers taking diplomatic matters into their own hands. Chief strategist Stephen Bannon attends National Security Council meetings and the Washington Post reports that he recently spoke with the German ambassador. Jared Kushner, Trump’s adviser and son-in-law, has been tasked with smoothing over relations with Mexico and brokering a Middle East peace deal. Since Tillerson spent his entire career at Exxon, it’s no surprise that it’s taking him some time to get up to speed. However, it appears the president is making the process more difficult. As in other federal agencies, many positions have yet to be filled, and Trump nixed Tillerson’s choice of Elliott Abrams for deputy secretary of State (because he opposed Trump during the campaign, not because of his previous involvement in covertly selling weapons to Iran and promoting genocide). Now Tillerson is looking for a way to signal to both staffers and foreign governments that the State Department’s influence isn’t waning. Politico reports that he’s asked aides to draft a paper explaining ways that he can increase his access to reporters and boost his media presence. Previous reports suggest media appearances are a key way of communicating with the TV-obsessed president, but it’s a risky move. Trump is said to pay close attention to aides’ missteps on TV, and even how they’re portrayed on SNL. Kellyanne Conway disappeared from the airwaves in the last week after claiming National Security Adviser Michael Flynn had the president’s “full confidence” hours before he was fired. The last thing Tillerson needs is to be caught publicly contradicting Trump because he didn’t catch the president’s latest angry phone call with a U.S. ally.